Transcribing historical letters has been one of the most fascinating and enjoyable tasks required in my work with special collections. It generally requires reading personal correspondences from the past and diving into the history of the authors. Imagine a librarian, 100 years from now, reading your descriptive emails home to your parents, your embarrassing facebook messages to your friends, or even those angry texts sent to an ex-lover. What sort of telling anecdotes could be gleaned from your supposedly private conversations? My first assigned letters to read at Villanova University were those sent from Eleanor M.S. 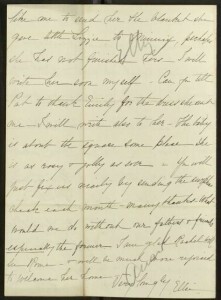 Thackara (“Ellie”) to her father, William T. Sherman [http://digital.library.villanova.edu/Item/vudl:35563; http://digital.library.villanova.edu/Item/vudl:35568; http://digital.library.villanova.edu/Item/vudl:35578]. In her correspondence, Ellie updates her Papa on such events as her recent visit to her mother and the welfare of her own baby. Most prominently seen in this trio of letters, however, are Eleanor and her husband’s plans to move to a new house. It is a costly venture….for which Ellie requests her father’s funding. The manipulation incorporated into these letters strongly reminisces of a child’s request for money from their parents in the modern age. Ellie begins her letters with expressions of adoration for the new residence, which she claims to be both aesthetic and practical in location; she convinces her father that this place is the best option, and what father would not want the best for his daughter? Next, she laments the costs involved with the move and references an offer of financial aid previously made by her father. She does not merely suggest he uphold his promise, but very considerately acknowledges that he may not have the funds or desire to assist in the manner which she proposes. Of course this thoughtfulness would inspire likewise kindness. After receiving confirmation of her father’s agreement to send funds, Ellie requests further finances, by describing her concern that she will have to sell some of her Government Bonds in order to furnish the new home. William must have felt compelled to take care of his darling daughter, based on her response. When it comes to heartfelt thanks, Eleanor excels in expressing herself. It seems some interactions transcend time. Posted for William Robinson, Spring 2014 Digital Library Intern. 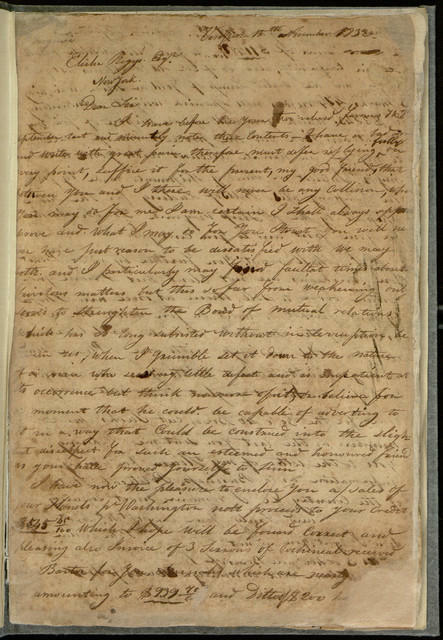 The Digital Library at Villanova continues to digitize and transcribe the Barry-Hayes Papers, owned by the Independence Seaport Museum. The papers remind us that in the 19th century, sons often followed their fathers into a certain line of work. The collection has many letters written by the relatives of Commodore John Barry, considered a “father of the American Navy”, that discuss the naval and merchant careers of the sons of Revolutionary War era naval officers. 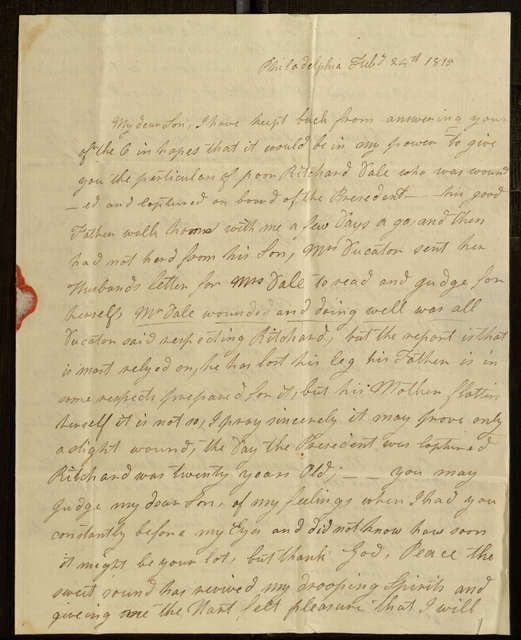 In “Letter, To: ‘My Dear Son’ From: Mother Elizabeth Hayes, February 21, 1815”, Elizabeth Keen Hayes, the daughter-in-law of John Barry, tells her son Thomas Hayes, a midshipman at Boston Navy Yard, about the injuries of Richard Dale Jr. Dale Jr. was the son of Richard Dale, one of the original commodores of the Continental Navy who had fought under the command of John Barry and John Paul Jones during the Revolutionary War. In January 1815, serving aboard the U.S.S. President in the War of 1812, the British took him prisoner after he was struck by a cannonball in a sea battle off the coast of Bermuda. Elizabeth Hayes has received news from Richard Dale that Dale Jr. has been injured, but still hopes for his recovery: “the report is that is most relyd on he has lost his leg his father is in some respects prepared for it but his mother flatters herself it is not so. I pray sincerely it may only prove a slight wound, the day the President was captured Richard was twenty years old”. Hayes also discusses a letter from Stephen Decatur Jr. to Mrs. Dale describing her son’s injuries. Decatur Jr. was a celebrated naval commander in the Barbary Wars, the Quasi-War with France, and the War of 1812, and his own father was a naval officer who had fought in the Revolutionary War. Hayes reports that “Mr Dale wounded and doing well was all Decatur said respecting Richard”. The letter gives an interesting glimpse into the generational influence of naval warfare, the pace of communication in 1815, and the anxiety felt by a mother over her son’s work. The letter has references to three descendants of Revolutionary War era naval officers; Thomas Hayes, Richard Dale Jr., and Stephen Decatur Jr. Elizabeth Hayes can only speculate about the injuries of Richard Dale Jr. and must wait for more information. She expects that Dale’s mother will not admit the severity of her son’s injury, but his father is more prepared to accept bad news. Elizabeth Hayes also expresses worry about Thomas coming to harm in the war as a midshipman. She writes “you may judge my dear son of my feelings when I had you constantly before my eyes and did not know how soon it might be your lot, but thank God, Peace the sweet sound has revived my drooping spirits and giving me the hart felt pleasure that I will see my see my son again ere long”. The Treaty of Ghent, ending the War of 1812, was signed in December 1814, but it was ratified in Washington only days before Hayes sent the letter to her son. In the time the Treaty of Ghent reached Washington, Richard Dale Jr.’s injuries worsened and he died in captivity in Bermuda. 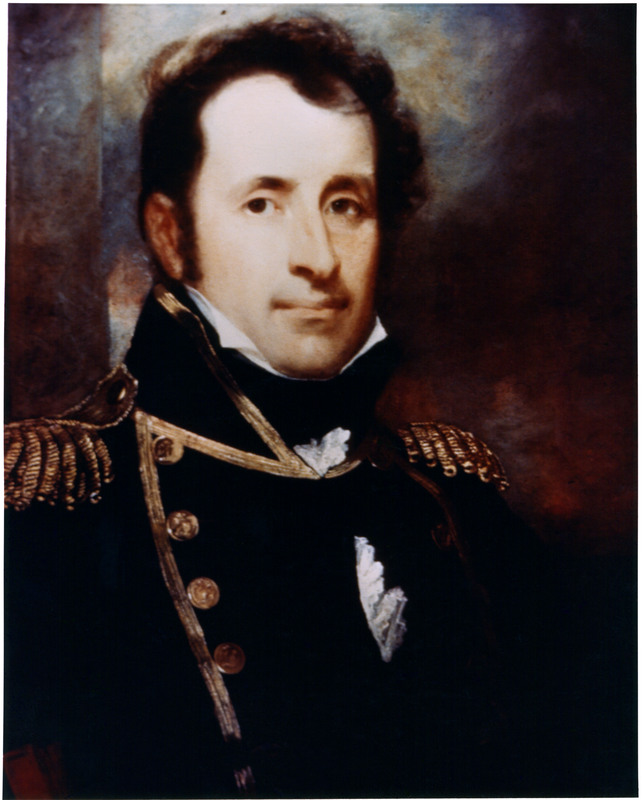 Stephen Decatur, commander of the USS President, courtesy of Wikimedia Commons. Read more manuscripts from the Barry-Hayes Papers. Find out more about the collection in the Barry-Hayes Papers finding aid, developed by the Independence Seaport Museum. Today in electronic communication, when an email is composed and sent, an automatic copy is routinely placed in a “Sent” mail folder. In the manuscript era, however the only way for an author of a letter or memo to keep a copy of the correspondence was to manually scribe a copy. This may have been a “fair copy” – a nearly exact copy of the sent letter, or a draft copy, which would included revisions and edits. Some authors kept these fair and draft copies as individual sheets, while in other cases, a bound book of blank pages was used. The two letter books kept by Peter Cullen, during the 1832-1934 years, are good examples of the bound format of sent mail and document his ongoing commercial correspondence. These were draft copies as the numerous corrections and emendations can attest. Over 90 leaves of letters are present in the 1832-1833 volume; the 20 leaves of the 1834 volume are newly available in a transcription by library staff member Frances DiLenge. I always love looking through the various letters that we’ve digitized because I always find something interesting and/or exciting about these snapshots of life in a time gone by. Today’s historical encounter: Nellie Bly. She was a late-19th/early-20th-century reporter, best known for going undercover to expose the awful conditions of insane asylums and travelling around the world to recreate Jules Verne’s Around the World in Eighty Days and attempt to beat Phileas Fogg’s 80-day record. This one-line snippet is the only mention of Bly in the letter—just a quick remark on current events that Ellie included in a letter to her father. And that’s another interesting thing: this really was a current event, hot off the presses. Ellie’s letter is dated only Jan. 25th, no year, but an archivist later added an uncertain “[1890? ]” at the top of the letter. In fact, this casual mention of Nellie Bly beating “Miss Bisland” gives a remarkably specific timeframe for the letter: Nellie Bly returned to Hoboken, NJ (her original point-of-departure) on January 25, 1890 at 3:51pm. The very same day that Ellie’s letter is dated! From this, we can imagine that Ellie read the news in an evening paper and was still thinking of it while composing a letter to her father later that same evening. 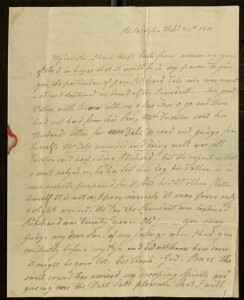 This letter is part of the Sherman-Thackara Collection. You can find more letters throughout our Digital Library Collections—and do let us know if you find anything exciting! It’s clear that the Barry-Hayes Papers collection, owned and housed by Independence Seaport Museum, offers a unique perspective on the early nineteenth-century shipping trade in America. Occasionally in the course of transcribing these fascinating documents we come across one that also has the potential to serve as primary source material for the biography of a famous American or some topic in American political history. Here I’d like to report on a letter I recently transcribed which will be of great interest to scholars of the Jacksonian era in American politics. (Take a look at it here.) It also includes a reflection on the final years of the namesake of a major thoroughfare in South Philadelphia, and quirky riddle for you to solve. 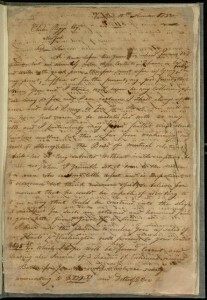 Top of “Letter, To: Isaac Austin Hayes and Patrick Barry Hayes, From: Thomas Hayes, June 8, 1831”. In 1831 brothers Isaac Austin and Patrick Barry Hayes were in Brazil using their maritime skills and connections to run an import/export business. 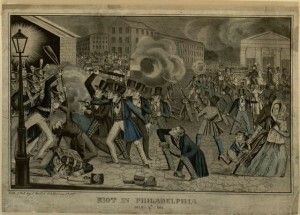 Their elder brother Thomas Hayes occasionally wrote from Philadelphia with news of home, and several of his communications are gathered in Series X, the papers of Isaac Austin Hayes. 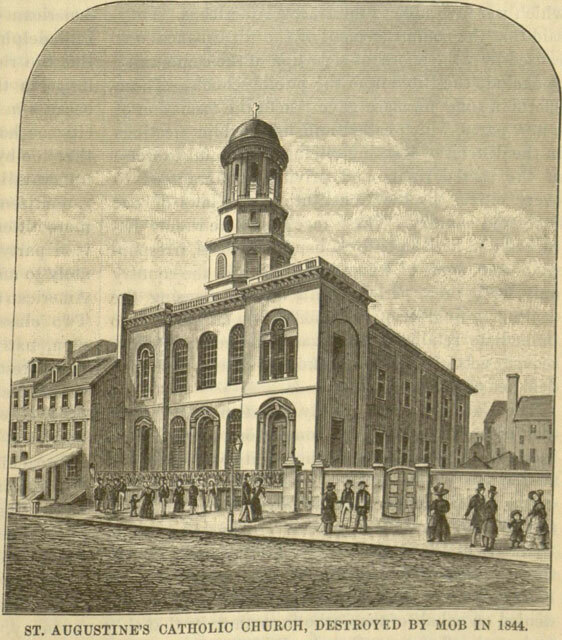 Thomas’ letter of June 8, 1831, was an especially long one, full of news of friends and acquaintances both prominent and obscure. Can you decipher the odd words of Thomas Hayes? It took a bit of puzzling before these weird obfuscations came into focus. I figured it out—can you? Sometime in the 1890s, the love letters shared between Eleanor Mary Sherman (Ellie) and Alexander Montgomery Thackara (Mont) were donated with the rest of the Sherman-Thackara Collection to Villanova College, presumably by Ellie herself. Surely, Ellie saw the value of preserving documents pertaining to her famous father, General William Tecumseh Sherman, as well as to her husband Mont, who was appointed to serve as a U.S. Consul at Le Havre, France in 1897. 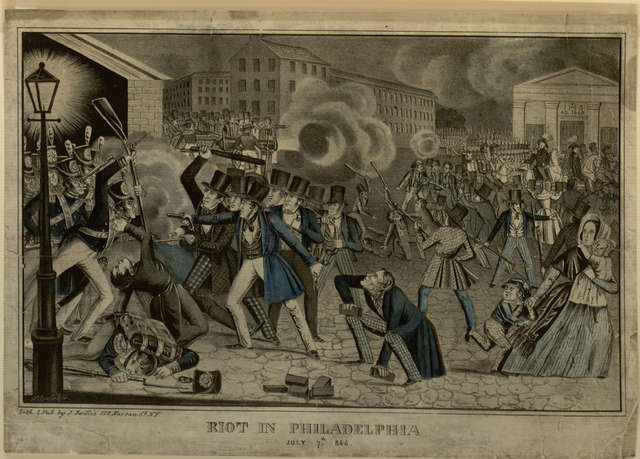 As the library and its patrons have been discovering, this collection also reveals much about Philadelphia and the Main Line toward the end of the nineteenth century and is a rich primary source for studies of middle-class Victorian life. Because they are available in both Falvey’s Special Collections and Digital Library, these letters are also situated to reflect how different technologies might impact the ways we write and receive personal correspondence. Although Ellie could not have envisioned their digitization, wide dissemination, and nearly instantaneous accessibility, her donation ensured that letters to Mont would become letters to each of us. At the same time, personal letters are characteristically private. We generally ensure this privacy by sealing a letter in an envelope intended for one recipient. Privacy, therefore, also personalizes the document. Letters may be sealed by drops of wax imprinted with a unique stamp or by glue moistened with the sender’s own mouth. In her letters, a young Ellie repeatedly claims this sort of private intimacy with her “own dearest, dearest Mont” , anticipating the days when she would be his wife in singular devotion. Until that time, the tangible letters would often serve as a surrogate presence when Ellie and Mont were apart. Just as we can see, touch, and smell one of these letters in Special Collections, Ellie would repeatedly delight in her beloved’s epistolary touch, even were Mont unable to drop by to share one of their customary four o’clock walks. Combined with Special Collections, digital availability might seem to compromise the private intimacy of these personal letters. However, while electronic communications are popularly blamed for the handwritten letter’s fall from favor, the Digital Library potentially balances the direction of influence between electronic and written texts. Generally, the investment of personal time, energy, and attention valued by letter writers is deemed an unnecessary expense by digital correspondents. 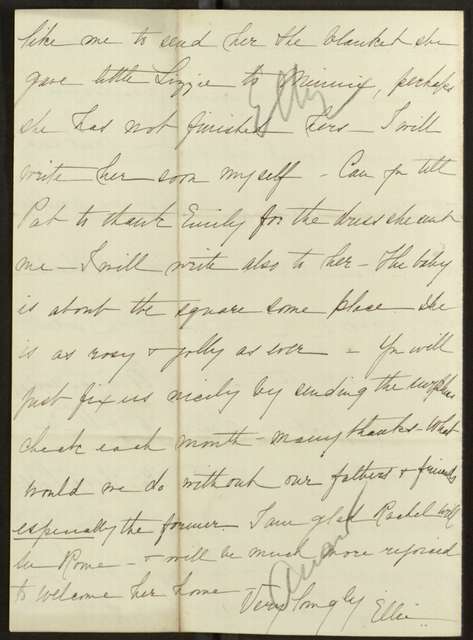 But a digital transcriber steadily gains an intimate appreciation of Ellie’s letters as he faithfully reconstructs them, collaboratively renewing her creative energy and attention. Any reader can likewise peruse digital images of Ellie’s letters and participate in the slower pace of time and human correspondence in which intimacy deepens. A reader will also witness the impassioned frequency of Ellie’s letters, sometimes several in a day (see, for instance, March 12, 1880; letters 381, 382, and 383), whose impatience is necessarily tempered by the tension of time required for Mont’s response. Ellie creatively delights in these spans of time. In one instance, she opportunely poses an impromptu riddle to Mont and promises an answer for when they next meet, thereby sweetening the expectation of their intimacy. This game may seem quaint in an age of truncated text and instant messaging, when cascades of emails often overwhelm our ability to respond, let alone contemplate, our textual relationships. Here in the Digital Library, however, some of the best qualities of electronic and handwritten correspondence complement one another. Right now, everyone can repeatedly examine and enjoy any image in the collection, much as Ellie would have pored over Mont’s letters. In time, users will be able to search transcriptions for particular keywords with a virtual familiarity akin to Ellie’s attentive devotion. In the process, the digital medium will preserve and exhibit—and possibly inspire us to participate in—the kind of correspondence we can savor like an intimate walk with a companion … perhaps Ellie, Mont, or someone else we’ve been meaning to write.